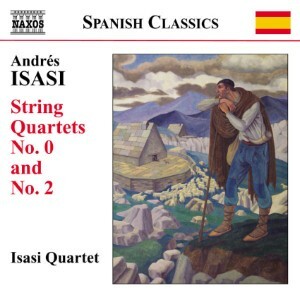 Spanish Basque composer Andrés Isasi made his first appearance on Naxos nearly a decade ago (8.557584, review), so this sequel has been a long time coming. However, two further volumes towards this complete quartets series are promised and have indeed already been recorded by the Isasi Quartet. As the accompanying notes explain, there are three more full works extant, as well as a three-movement quartet that was likely unfinished, a few fragments and two stand-alone short pieces for the medium. With luck those discs will pack them all in and be more generously furnished than this one. Written just over a decade apart, these two quartets are fairly similar in essence, if less so in practice. Elegance, wistfulness, folk influences, memorable melodies, minor keys and a lack of pretentiousness - these are prominent features of both. As the promotional blurb says, Grieg and Dvořák are two of the more obvious references, but so is someone like Weingartner in the more Germanically oriented A minor work. There is at any rate hardly a trace of Spanish or Basque nationalism in these works - lending Naxos's 'Spanish Classics' ticket a touch of irony. Despite their name, the Isasi Quartet are a primarily German ensemble, an attribute that fits rather well with Isasi's style. This is an impressive debut for Naxos by the Quartet: sympathetic and thoughtful, technically adept and cogent. Sound quality is pretty good, clean and spacious with just a hint of perforation at the edges. One minor complaint is that the final milliseconds of each track have had natural reverberation quickly killed by human intervention. This happens surprisingly frequently even in modern recordings where extreme shortage of space is rarely an issue; only producers will know why they do such a pointless thing, but at least in this case the effect is minuscule. Richard Whitehouse's descriptive notes are typically informative and well written. Roll on, volume two.